What’s the difference between blocking and pinning minions in League? Minions created quite a stir yesterday in the LCS. Here’s how they can help you in solo queue. An unexpected stir was created in the LCS last Saturday when the observers caught the 100 Thieves duo lane messing with some minions. The move, and specifically rules about trapping versus pinning minions, caused quite a bit of consternation in the coaching and analyst community before LCS commissioner Chris Greeley apologized for the rules confusion. Greeley ruled that blocking minions is allowable—that’s what 100 Thieves were doing. But trapping minions against terrain is still against the rules, and teams that do it intentionally can forfeit the match. So what’s the difference, and why would teams do it in the first place? Minion blocking is a mechanic that’s been around forever. Anyone who’s been trapped by minions knows how painful it can be. Early on in the development of MOBAs, Riot Games decided that, in contrast to DotA, League players were not supposed to mess with allied minions. The biggest difference in this regard was that Riot’s code does not allow champions to attack allied minions and thus deny their opponents of farm and experience. But attacking minions isn’t the only way to manipulate them. Players figured out years ago that standing in front of minions would cause them to walk around the champion model. And by continually repositioning to be in front of the minion, you could block it from its intended path, delaying it from reaching its final destination. That doesn’t sound like a big deal, but if you do it carefully at the right point in the game, you can manipulate an entire wave to arrive later than the enemy minion wave. Players can set up a freeze to farm in safety and expose the opposing laners to ganks. 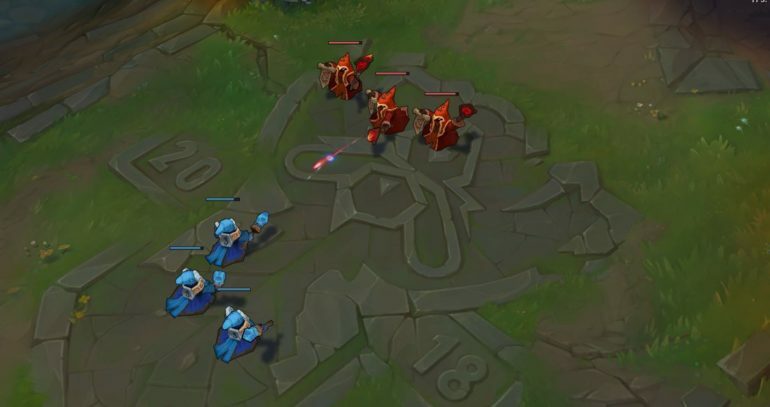 Later, after the freeze is broken, you can force slow push into the enemy turret to either help siege or to set up a good recall. And you can do this without interacting with the enemy champions or minions. Again, this is a departure from the way minions behave in other games largely because Riot doesn’t want players messing with the overall flow of the game. DotA players may point to interactions like this for evidence of why their game requires more skill. But Riot has good reason for wanting minion interactions in League to be more consistent and for the game to focus on player-vs-player interactions, rather than player-vs-environment. According to to Greeley, blocking minions by standing in their path and forcing them to go around is legal. But trapping is not. So what’s what? Trapping is more problematic than blocking because it more readily ensures a freeze. In the duo lane, you could even have the support trap a minion for the entire first wave, denying the other team one minion’s worth of gold and experience. Blocking might happen on accident during a game, but trapping has to be done purposefully. Regardless of the reason, Riot has deemed trapping a more serious issue that can be punished by a forfeit. How big of a deal are these mechanics? These seem like super fine points of gamesmanship that don’t have a major impact on the game. Many players may have never noticed what 100 Thieves did or ever encountered this in solo queue. So why all the fuss? Well, part of the reason is the point in the game we’re talking about here. It’s unlikely teams would use this beyond the first one or two waves. Later on, minion wave management becomes more of a macro issue that is influenced by matchups, lane assignments, and objectives. Even the best teams routinely screw up basic wave management in the late game, so rest assured they probably won’t go to these lengths to set up a freeze or a slow push. But at level one, the impact of freezing or trapping minions can have big ramifications on the game. Tiny changes in experience and gold can shift entire game strategies. Some duo lanes design plays based on the exact minion that both allied champions hit level two. It would be extremely awkward for them to be wrong on the minion count because of a creep block and burn summoners when they don’t have the right spell leveled yet. In the 100 Thieves example, Thieves bot laner Bae “Bang” Jun-sik was able to create a freeze that lasted past the fourth minute of the game. That basically made him gank immune for nearly three minutes. Clutch Gaming didn’t happen to have an early game jungler. But if they did plan to gank bottom at level two or three, a common strategy in this meta, Bang’s shenanigans would have likely foiled their design. So this stuff matters. Now that the rules have been made clear, expect more teams to try blocking minions. And if one team does it, it would make sense for the other to respond. Now we’re getting into real heavy game theory: Do you block your own minions so that the other team’s block doesn’t result in a freeze? It’s enough to make your head spin. And what if your jungler needs a leash? What happens then? These are details that analysts and coaches obsess over. They can’t always control what happens past 20 minutes when the game state is totally unpredictable. But at level one, they have a lot of control, and strategies like this are another tool in their box. It will be extremely interesting to see what strategies evolve out of the minion block controversy of 2018.